Bogtrotter’s is an interesting sort of place. It’s isn’t it’s own restaurant, it’s actually just a service counter located in what used to be a side entrance to The Old Angle bar next door, with just two stools and a shelf for eat-in dining. But they also have a nice arrangement with The Old Angle, who doesn’t mind you eating a Bogtrotter’s sandwich in their dining room, particularly if you are washing it down with one of their tap beers. 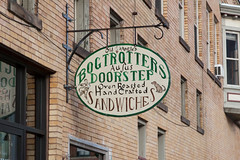 As far as the sandwiches go, the basic idea at Bogtrotter’s is the au jus sandwich. You know, like a French dip, or a Hot Italian Beef sandwich. 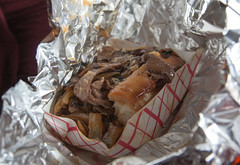 And, indeed, one of their menu items, the “Chicago”, with beef, peppers, and provolone, is basically a Chicago Style Hot Italian beef sandwich. But they go far beyond that, with a full menu board of different sandwiches, ranging from the “Philly” (basically a variation of the Philly cheesesteak, with beef, grilled onion, mushroom, and cheese sauce) to the “Porkopolis” (roasted pork with spicy greens and provolone) to the vegetarian “Haight” (roasted veggies, provolone, marinara, and mushroom jus). All served up on crusty French baguettes, with your choice of how much jus to be applied (“dry”, “wet”, or “soaked”), and whether or not you want “crunch” on it (broken up kettle-cooked potato chips). And they aren’t cutting corners here, Bogtrotter’s seasons and roasts all the meats themselves, and makes their own jus. 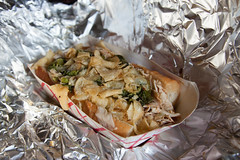 So, looking over the menu, I opted for the Porkopolis, wet, with crunch. The resulting sandwich, shown here, was pretty much the definition of a “hot mess” (I barely managed to actually eat the thing with my hands, with plentiful napkin usage), but oh what a tasty mess it was. The sandwich ended up combining some of the best aspects of a good roasted pork sandwich (like I would get from Tony Luke’s) and a Hot Italian Beef Sandwich (like I would get from Al’s). The pork meat itself was a rich, flavorful, and tender pork loin, with a good spice rub on it, served up in thick slices. The spicy greens were flavorful and complemented the pork quite well. The pork jus was a wonderful thick and garlicky pork broth that thoroughly soaked the entire sandwich, but the French loaf was crusty enough to (mostly, it was a close call at points) hold up to the liquid onslaught. And the “crunch” turned out to be a nice textural addition to the sandwich; I’ve never been much of a fan of potato chips on sandwiches, but once they slightly softened up from soaking up the jus, they just, well, worked. Carol’s “Philly” was a similarly great sandwich. This wasn’t a cheesesteak, instead having thick-sliced roast beef (as nicely roasted and seasoned as the pork on my sandwich). Loaded up with some grilled onions, mushrooms, and cheese sauce, then drenched in beef jus, the result was just as much of a mess as my sandwich, but just as delicious. Again, the combination here just worked.